Last November 22, the Italian actress Maria Grazia Cucinotta christened the Costa Fortuna in Genoa, with 2,702 lower bed capacity. In that moment, it became the biggest passenger ship in Costa's fleet and in the whole history of the Italian merchant fleet. Costa Fortuna is the first of two new 105,000-ton vessels commissioned from the Fincantieri yard in Genoa Sestri. Her sister, Costa Magica is scheduled to enter service in November 2004, increasing Costa's fleet to eleven ships with a total capacity of about 18,500 passengers. Another ship of bigger size is now building on the Sestri factory of Fincantieri, and she will become, when will be delivered in 2006, in the biggest European cruise ship. Joe Farcus, the topical Carnival Cruise Lines' inside designer, designed the Costa Fortuna. Costa Fortuna's theme is inspired by the Italian transatlantic liners and also in the concept of "cruising Italian style". But the new Costa's cruise ships are very different from the heyday of traditional Italian cruising, which began in the 1930s and ended whit the demise of Italian Spa in the 1970s. So, the ship is a blend of the past, and of the future. The past is her theme; but the future is the entrance of the mega ships in the European cruise market. The Costa Fortuna is the first floating holiday resort for the Europeans, a destination itself, rather than a means to know several port of calls. But as I expected there is little that resembles the ocean liners of the past these lounges are themed after. To me, putting up a mural (or a scale model) of an old ocean liner and then naming the lounge after her doesn't suddenly make the lounge "themed" after the ship. It takes more then that. Unfortunately, there isn't on board little more of a hint that would remind one of these ocean liners. The Cunard heritage panels on board QM2 work better to form a liner ambience on board. The Costa Fortuna isn't the ship for the people that want to see the Indian walnut balustrades and yellow Siena marble columns that decorated the old Conte di Savoia. And there weren't any 18th-century tapestries and onyx light fixtures as on the Rex's wood-panelled first-class lounge. But the Costa Fortuna is designed to appeal to the European mass-market, and I think if the previous Farcus designed Costa ships (the Atlantica and Mediterranea twin) have been selling out and are well received, the Costa Fortuna will be not the exception. I think there is a lot of the ship I actually like, but I was hoping for something more considering the "ocean liner" theme. In some spaces, I think Farcus only use the name of the liner to create a direction, an excuse, of the design. Passenger decks are named after the ports that Costa ships visited during the liner epoch: Rio de Janeiro, Miami, Buenos Aires, Santos, Genoa, Lisbon, Caracas, Vigo, Napoli, Barcelona, Cannes, Funchal and Las Palmas. Is I already say in another new Costa ships reviews, I think Farcus is great for Carnival, but Costa should have used their own designers, such as HAL, another Carnival Corp. branch. The result of the Farcus' design is very little "Italian" in the décor. The Fortuna atmosphere will be the same found in another cruise ship with the same theme. You can only change the ship models, the ship paintings, etc. Of all the things about this ship, the least Italian is the design! After all she is Italian-built, Italian-flagged, catering to largely Italian passengers, and so on... But the décor looks more like Vegas than Genova. I would have preferred something more Italian style, like the Romantica or Classica sisters or even Costa Victoria interiors, for the Costa new buildingsŠAnd the less glitz of the three is without doubt the Fortuna. The Costa Fortuna's hull is derived form the Destiny Class of Carnival Cruise Line. But the Fortuna isn't an exact replica of her American sisters. Both (American and Italian ships) share the same two dining room lay out, which means that two third of the lower passengers deck are unused during a lot of hours a day. Also, a big theatre is located on the forward part of the hull, and the immense atrio is also located in a forward position. But there are definitely some major design flow changes on Fortuna from the Destiny Class of Carnival. On Costa Fortuna, the casino and disco are moved aft, one above the other and I think the change is quite effective. They are both noisy places, draw much of the same crowd, share almost the same timetable and, as consequence, are well suited near each other. 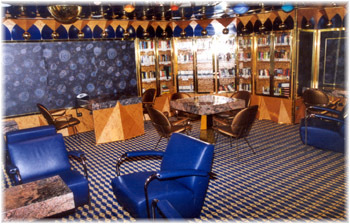 The old casino area on the Destiny Class ships is now the huge Conte Di Savoia Lounge on Costa Fortuna. Also, the Costa Fortuna is plenty of several other dance floors, as Costa passengers like to dance. One is in the lobby with a giant Costa "C" inlaid into it. The lay out of the bar here is another difference. On the first Destiny ships, the bar is located forward, close the lifts, but in the Fortuna is fitted opposite the lifts, down the Costa ship models. Lastly, a third level was added to the small atrio of the buffet restaurant to locate the alternative restaurant Conte Grande. Again with another dance floor added, making this space is very successful. On the Destiny Class ships it is only two levels. I am very pleased in the changes made to the design and layout, and the passenger flow (mainly in evening time), is greatly improved. Her external shape, despite her massive dimensions, is nicely proportioned. The slope of the superstructure forward and aft, as well as the well between the two "towers", means that the Costa Fortuna has a good volumetric balance. This fact must improve in the enlarged version of this vessel, now building in Genova. But the straight Costa funnel, which has 20 meters in height and 9 meters in width, don't fit well with the inclined superstructure. Another feature of the design is the amount of natural light on board. There are several skylight or glass domes, in the atrio, alternative restaurant, Spa, etc. that introduce a lot of natural light on Costa Fortuna's inside decks, make they roomier and airier. The two main dining rooms (the Raffaello 1965 and the Michelangelo 1965) are both examples of how Farcus take its theme from the artist (looking at the ceiling) rather than the ship. The only links with the two latest Italian liners are copies of her original advertising located in the walls. Both two deck high restaurants, which serve three meals a day at set times with assigned seating, share several design elements, such as the yellow balustrade crowned with a red handrail, an unusual mix, repeat every where (between windows, on the well, etc) and the blue and yellow ceiling and wall partitions also find in the atrio. Also another common design element, the "C" funnel is present both restaurants. I don't understand why the most recognizable part of the older sister, her lattice funnels, isn't used both restaurants. Really, a good idea will be to changer the yellow column balustrade, for another one with follows the original stack design. The first one is Raffaello 1965, is located amidship, between the atrio and the galley. This space is fitted with a central staircase in her atrio entrance. Her decoration combines renacentist elements, such as fresh reproductions of Raffaello paints located in the striking coffered ceiling and Murano glass plain circular chandeliers, with many modern lights, stainless steel pillarsŠ and the yellow upholstery of the chairs. The furnishings are composed by lights wooden chairs and tables for 12 people. A luxury detail is the dishes used, that seems fine and elegant. But the head ceiling in her lower level, around the well, are low, and the windows are obstructed views, due to lifeboats, that means a lesser entrance of natural light. Both facts given some feel of roomless. The Michelangelo restaurant, located aft of the galley, in the poop of the ship, larger of the two, has large windows aft facing the stern for a spectacular sea view in the moonlight. The decoration is similar than on Raffaello: the coffered ceiling contains here enlarged details of the Sistine Chapel frescoes painted by Michelangelo in the 16th century. The furnishings used are practically the same. In the entrance hall, on deck 3, there is an enormous model of the 1965 built ocean liner Michelangelo, which was rebuilt by Costa for the Costa Fortuna. Also, the ceiling of the entrance hall, which acts as a second atrio, has more models upside down. The Conte Grande 1927 alternative restaurant is one of the best decorated places on board, and the cuisine and service is also superb. It's located on the very top of the ship, between the balcony of the buffet and a splendid skylight. It will be ideal for romantic evenings, viewing the star-studded sky, while listening piano music. There is a 23 Euro service charge and the place has seating for less than 100 guest. This "U" shaped room has a decoration that is a mix of marble, brass, wood and garnet tapestry, which certain Art Deco details. A big Cristobal Colon portrait is located in the aft wall of the small atrio. Newly, the only disappointing opinion is her lack of head ceiling around the well. Three stair tower connected the different deck of the Costa Fortuna, as well as 18 lifts. But the ship's most vertical stunning area is the Costa Fortuna's Atrio, nine decks high and fitted forward with four spectacular panoramic lifts that climb to the highest deck of the ship, where an skylight filters the light, and a paint of the goddess Fortuna crown the atrio. This huge space is decorated mainly in blue, stainless steel and woods. The furniture on her lower level is mainly red, and the big chairs and sofas are the most comfortable on board. The blue comes mainly from horizontal stripes that I think feel the sea. But the star of the atrio is the Costa fleet evolved over the years. Farcus transformed the ceiling into the blue surface of the sea where all 26 Costa Crociere passenger ships, on a scale of 1:100, are depicted sailing upside down. The woods are mainly used in balustrades (in form of squares), combined with stainless steel, and in the tall pillars between the lifts. The lower level of the atrium houses the information (starboard) and shore excursion (port) desks, a curved crescent bar (aft) with a very long counter plenty of Costa logo, that is a popular gathering place for passengers, a small dance track with the "C" Costa motif and near a small stage forward with a piano. Here, the walls are decorated mainly in crude and brown tones, and the atrium, as in other Costa ships, show modern furnishings, but also some classic bas-relief (newly a modern-classic mix). The light in the walls, additionally to the ceiling lights, configures the decoration of this space. On Carnival Destiny class, the atrio bar is in front of the elevators. On the enlarged Carnival Conquest class it has been switched to the other side and is now in front of the lobby stairs. This is consistent with the design of the Spirit Class atriums (as the Costa Atlantica and Mediterranea), and I believe this Carnival change made the lobby more spacious. So, Costa also incorporated this modification in the Fortuna/Magica as well. On the second level of the atrio is located the Galileo Galilei library. Newly, a liner name is used as excuse, and this place is really dedicated to the Italian Renacentist scientist. The ceiling and curtains show all planets and her orbits around the sun. This is a quiet place, fitted with blue sofas and plush padded chair and square marble tables. Also features a big collection of Italian and English books in her golden shelves. Also, both sides of this gallery house the photo gallery. On the third level of the atrio balconies (deck Genova), forward of the Conte di Savoia are located several small and intimated rooms, such as the Card Room and the Roma and Augustus bars. Here, around the atrium is located starboard the Art gallery, with numerous pictures and sculptures, where passengers can admire or buy works of art displayed on the ship. The Shopping gallery is located port and starboard sides, with several stores that offer an ample offer to the guests: a perfume shop, a complement shop, shower and bath articles, souvenirs and Costa merchandising and, of course, the duty free shop. All these spacious are decorated with very good taste, with nicely classic designed pillars, brown marble and some well resolved shop fachades, which give an image of elegance and luxury. Newly this classic elements are mixed with modern touches, such as the whole Costa fleet in the ceiling, and the railings, that newly "collides" if we were observing the whole decoration of this deck. The Rex Theatre is dedicated to the most famous Italian ship of all time: the transatlantic liner Rex of 1932, and the theatre is the largest and most spectacular public room on the ship. Extending over three decks, it has a seating capacity of 1,300, while the sound systems, stage lighting, scenery, rotating stage and raiseable orchestra pit are the most modern offered by today's technology. The only direct link with the old Rex is a splendid model located in the starboard entrance on her lower level, and two stylised bows of liners located both sides of the stage procenium. Also, pictures of the Rex funnels are located in the forward wall, on the lower level. I think the theater has a nautical decoration, with like old outdoor deck lighting everywhere (walls and ceiling), with a "X" protection, and blue and brown tapestry. The entrances are a marble floor. The lower deck has large brown sofas with small tables, whereas the amphitheatre lack the table, but has large armrest. There are a lot of stainless steel pillars, that means difficult views for some seats. The terraced lay out provide all seats a perfect vision, and the corridors are ample, but has a pronounced slope. Between the Casino and the Costa Atrio is located the Conte Di Savoia Grand Bar. This bar has an asymmetrical lay out. The corridor is located near the side, and creates two zones. First, a narrow place between the ship side and the corridor, limited by a glass wall, that works as card room. Is decorated mainly in yellow tones, with square tables. 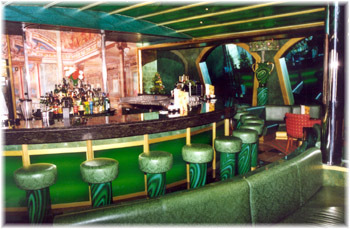 And second, the bar itself, located port side, decorated on blue tones with circular green marble made tables. This space has an opulent décor: The ceiling has golden baroque frames and, between the windows, there are also grand gilt capitals. The pillars are multicoloured, and the fore and aft walls have green blue damask silks and niches with old nautical instruments. All these details (golden, gilded fabrics, marble, etc) accentuate the sumptuousness on this place. Also, this place is fitted with a great wood made dance track in the center and a big scene forward, ideal for live music concerts, surrounded by tables, sofas and armchairs for those people who like to enjoy a cocktail. Up the dance track is a paint about the Lepanto battle, as on the ball room of the liner which gives her name to this place. The bar is located aft, with a green counter. The Grand Bar Conte di Savoia 1932 is promoted as the largest bar on any cruise ship, with more than 500 square meters and 300 seats, and the focal point of social life on Costa Fortuna. There are a lot of couples dancing the meringue, tango, etc. But I also think that is another example of the contrast decoration found on the latest Costa cruise ships. 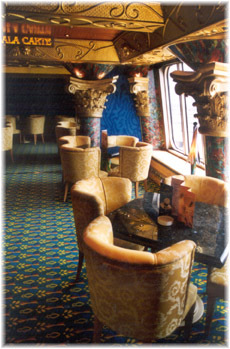 The Conte di Savoia Grand Bar looks like any other Farcus bars you could find on any latter Costa ships. The following space on deck Genova is the Casino Neptunia, which recreating the typical Las Vegas style found on all Farcus designed casinos. It has a considerable size, but I think it will be bigger if the Costa Fortuna will be deployed on USA waters. Costa think that Europeans will be the main customers of this ship, and they aren't so casino lovers of the as the Americans. But Neptunia don't lack any game, and there are a lot of tables on port side: blackjack, ruleta, poker and others. Also, the amount of slot machines on starboard side is very ample and, of course, there is a bar, together with all the accessories found in this type of spaces: large neon, glitz posters, specially designed lighting and heterogeneous furnishings. The carpet and upholstery are newly blue. The Neptunia 1932 Casino has an interesting feature. It has the disco right below, which is connected by glass-enclosed walls so you can watch the fun downstairs while gambling. A stair connect both places. Aft there are two small bars. The Conte Rosso 1921 is located starboard side, and has a full red decoration, a recall of the own Conte Rosso design. Tapestry, upholstery and ceiling are red made, as well as the pillar fitted between the windows. This is the piano bar on board, with a small stage surround by teak floor. Opposite is located the Conte Verde 1923 which, of course, has a mainly green decoration. But the colour theme here aren't so bowing as on Conte Rosso. There are green sofas, and also green malachite amphoras of Murano glass with green trees (a detail also found on the liner that gives her name to this place) on the walls. But the chairs are red. I think the emerald green illuminated ceiling has a disappointing effect, as well as the green lighting of the bar counter. This bar maybe the second disco on board due this lighting details. Between the two bars is located a second smaller atrio. And in the extreme aft, just up of the Michelangelo restaurant, was located the Leonardo da Vinci show lounge. This roomy space has an asymmetrical lay out, with a stage port side, and a sunken bar aft, due to her tiered configuration, to ensure optimum views for all audience. Her decoration is a mix of golden black and red tones. The contrast between golden and red has a striking effect. But I enjoy mainly the sofas and chairs with intensive red upholstery. Also, her walls displays reproductions of masterpieces like the Mona Lisa etched onto large glass canvases. The only disappointing design element is the lighting above the stage, with light of several colours that switch on/off speedily. This is the place for bingo, or art works auctions, but also to look back from the stern to see the wake of the ship through her large picture windows. The Vulcania Disco has a bar with a long counter on port side, a dance track with a glass floor, which nay be too little when the disco is full in the center, and a quiet zone with orange sofas starboard side. There are a lot of lights in the ceiling and a giant video screen spotlight forward in the glass track, that can be see from the large casino through large windows, because is found just under the casino and communicate by means of a spiral stairway. In the same deck, on the starboard side we are finding the Internet Café, with has 15 pc fitted with flat screens and ample sofas. Aft is located the children zone: A complete video arcade, housed in a space which isn´t too much enlarge, where the small passengers can enjoy the latest video games. There are plenty of activities for youngsters. The Squok Club is dedicated to children, and there is a video game room for teens. There is also an Internet Café. The Colombo Buffet, located on Napoli deck, is a long place located between the two pool zones, and usually is crowned. It has two deck (the main zone on Deck 9, Napoli, and a balcony on deck 10, Barcelona), which are communicated through a small atrio with a stair, located under a great glass dome that last in the alternative restaurant. As usual in this type of rooms located in the higher decks, the sea views are excellent through large picture windows both sides. Both skylight and windows means a lot of natural light in daytime, and a sense of roominess. I think is an airy place, with a nautical flavour in her design, in blue and green tones, plenty of old maps in tables and walls, old lighting, square sofas with globe earths, and blue tapestry and upholstery. The stainless steel ceiling has also painted waves. Here is possible to eat almost 24 hours a day without in an informal ambiance, and taste all type of food: heated dishes, such as meats, verdures, fruits, cakes and, of course, pizza. 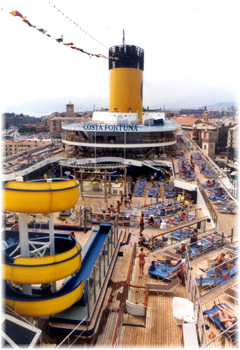 The Costa Fortuna has two lido decks. The Lido Oceania is located amidship and is the largest of the two. It features a bar and grill down the funnel where serve food and drinks close to the main pool. It is decorated in marine blue tones and I think it will be small in summer time, with a full load of passengers that don't like leave the pool to eat. The pool has two jacuzzi for eight people forward and is decorated by a sculpture and a large stage, as well as a complete sound and light installation suspended over the pool fir live music and entertainment. Forward there are a lot of sunning space in form as amphitheatre, in form of terraces as in the old Conte di Savoia. This space doubles as amphitheatre in night time. The terraced zone end in another pool with Jacuzzi and in the water slide, which is 9 meters high and 65 meters long. There is also a large "C" painted into the deck near the water slide. But the most pleasure detail is the terraced sunbathing space, all teak decked. But the huge amount of outdoor deck surface (almost 8.000 square meters) don't feel as large as really do, because it's fragmented, and in two lido zones. The Lido Colombo is located aft, and has a pool, two Jacuzzis and a bar and grill, with the same decoration as the buffet. Hear, a plastic floor is used, in place of teak. An important feature is the retractable glass floor, that means that the pool can be enjoyed in any time. This fact is consistent with the Costa's strategy of maintain this huge vessel in Europe all year. The immense Squok Club on Funchal deck (12) also has a wadding pool for children, as well a small water slide. Exercising has become an important part of people's daily lives, and the Costa Fortuna has designed with extensive sport and health facilities. Forward Cannes deck is located the two deck Terme Saturnia, a 1.300 square meters place that acts as the Spa of the Costa Fortuna. On her lower deck, the reception desk is very elegant and is located near the entrance hall, and close the male and female wardrobes, with free towel service. The baths are marble made, and generally all this installation show a good craftsmanship, with perfect finish. The decoration combines brown and red walls with blue tapestry, under a baroque theme, some times overdone. The massage room are accessible through a long corridor, and the sauna has sea views, a very interesting detail. On higher deck is located the gymnasium, fitted with a large picture windows with great slope, that easy to enjoy a magnificent sea view toward the ship's bow. There are a lot of the latest generation Techno Gym hardware, and a fantastic Jacuzzi is in the center of the room, that recreates a lake in the tropical forest, with rock, water falls and palm décor, under a skylight. I prefer the terraced lay out of the Costa Atlantica and her sisters, which gives more roominess sense. Here, the ceiling is lower than in her Finnish built fleet mates, and the sense of roominess, in spite of the highly reflecting stainless steel ceiling, that gives us the natural light through the windows is lesser. Other Spa facilities are hair stylists, beauty treatments and Turkish baths. Also, there is a jogging track on Cannes deck, and a multisports court aft the funnel on deck 12, with a stand with 150 seats. The Costa Fortuna has 1,358 passenger cabins to house 3,470 maximum passenger capacity: 464 outside cabins measuring some 20 square meters with big private balconies overlooking the sea; 331 outside cabins with window, which are some 16 square meters; and 505 inside cabins are 15 square meters. There are 30 cabins designed for disabled passengers with a surface of 20 square meters. The Costa Fortuna also has several categories of suites: 42 standard suites (which come with butler service and have bathrooms with tubs) has a surface of 33 square meters, the 14 lesser surface mini-suites has 27 square meters; and the two Grand Suites has 56 square meters. All cabins offer interactive colour TV, radio, direct dial phone, hand dryer, minibar, a seat and a small table, and individual climate control. The most economical in the ample Costa Fortuna's cabin inventory are the inside. It has a well designed bath which features a shower, a WC, a dressing table and some shelves. The walls and accessories are made in light green or blue tones, with a pleasing appearance. The closet are all laminate wooden made in honey colour, with sufficient space for a week long cruise and sufficient wide to house the baggage. The dormitory walls are made in lights colours to improve the sensation of roominess, and all are fitted with a king size bed converted into two individual beds, with two sideboards fitted with traditional lamps with reading lights. All lights must be controlled from a panel over the bed. The main lighting is perimeter indirect lighting. The standard outside cabin has almost the same surface, furnishing and decorative elements to the inside one. But the natural light means it look more roomy, more space sense. The seats and a small table permit some social activities in day time. 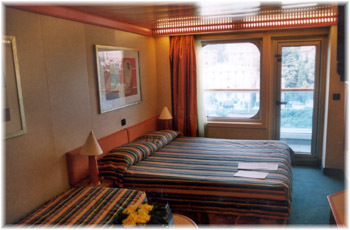 The balcony cabins are the main commercial appeal of the Costa Fortuna, as well as a strong advertising "hook" for Costa. The two meters long by one meter wide balcony is ample, roomy, ideal for any cruiser, and is fitted with two aluminium chairs and a plastic made table, that able to enjoy the better see views, to feel the wind in the face, as well as lot of intimacy and quiet to read a book or sunbathing. The screens between balconies will be removed to communicate two cabins shared for families. The lay out of the cabin is excellent, and look roomier, and the big mirror up the bed made it more roomier. It has lots of natural light, good dark wood decoration, ample storage and closet space, and a big sofa. The impressive decoration combines classic elements such as reproductions of baroque paintings and Doric columns together with modern elements, such as neon lights, lamps of curious form and design, but the overall effect will not let indifferent anybody. Costa Fortuna, the most modern ship of the fleet of Costa fleet, has all installations to offer many leisure alternatives in her vast space. I've always liked the "C" logo and of course all those fabulous ship models. I think is very original and clever. I'm not a fan of Farcus anyway, but this place is very much in keeping with my own style. I also think it does look toned down in comparison to Costa Mediterranea or her sister. For the rest of the ship, I don't like the work of Farcus for Costa. I visit the Costa Fortuna twice, and I see a Carnival ship through and through, from the water slide, to the signage, materials used, even cabins. It is essentially a Carnival ship with a Costa funnel thrown on. A fact that I enjoy is the art works throughout the ship. Even the elevator doors are decorated with reproductions of advertisements from the 20s and 30s, illustrating the interiors of the famous liner Rex. The CostaFortuna sailed last winter on 10-night Western Mediterranean/Canary Islands itineraries from Savona, Italy. This summer she sailed seven-night Western Mediterranean voyages. And, the next winter she newly heads from Savona in long cruises to the Mediterranean and Canary Island. I hope she will be a winner in the European market, due her unparallel range of places, and the attractive prices.